Get $20 cash back when you upgrade to the Weller WE! Harness 40% more power with faster heating and faster recovery times. Engineered to replace Weller's WES51 and WESD51, the Weller WE boosts efficiency, reliability and precision. Move up to the Weller WE before December 31st 2018 and get $20 cash back! It's fast. Soldering tasks are completed quickly and easily. It's user-friendly, with an ergonomic, high-performance iron. It's intuitive, with password protection to save your settings. It's cost-effective. Standby mode and setback features conserve energy. It's safe, with a reinforced safety rest and heat-resistant cable. It delivers. Temperature stability and lock protect and ensure repeatable precision. How do I cash in? Visit the Weller Rebate Center at weller.4myrebate.com to get started. 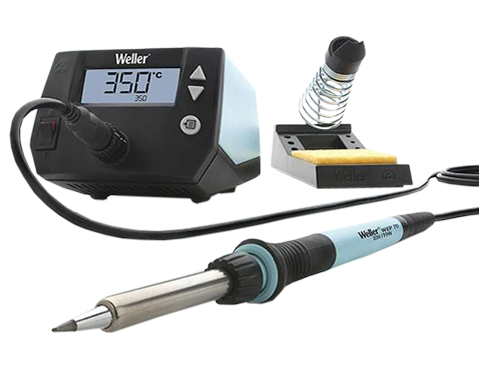 Upgrade from your existing soldering station to the Weller WE. Submit your rebate claim at weller.4myrebate.com within 60 days of your Weller WE purchase. Complete the necessary customer, product and reseller information. Upload your documents including invoice/receipt, Weller serial number, Weller UPC barcode and image of your old station's product number. You'll receive your $20 prepaid credit card within the next 5-7 weeks! Check out the promo flyer!